Res. Colonel and former MK Moshe Peled notes hypocrisy, ineffectiveness of boycott threats against Israel in Arutz Sheva interview. Boycott threats against Israel will not only be ineffective, but backfire - according to one Israeli official. "The boycotts will hang over our heads, but would really threaten the Palestinian Arabs working in Judea and Samaria," Res. Colonel and former MK Moshe Peled stated to Arutz Sheva Tuesday. "This is true coexistence with the thousands of Palestinian Arabs who work with us. Go check with the SodaStream factory in Mishor Adumim; what would the Palestinian Arab workers there do if they had to return to Jericho without a job?" 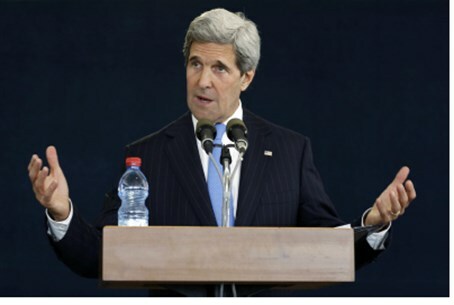 He added that US Secretary of State John Kerry, who made the boycott threats Saturday, has proved once again that he in incapable of being an intermediary in negotiations. "It is unthinkable that he has strengthened the Palestinian Authority (PA), that he has chosen the anti-Israel side," Peled stated. Peled noted that all threats against Israel until now have shown themselves to be ineffective. "The Americans threatened us not once but many times," he explained. "During [the term of Prime Minister Yitzhak] Shamir [they] wanted a building freeze, it was a terrible boycott and here we are, still here, active and growing." Communications and Home Front Defense Minister Gilad Erdan also criticized Kerry on Monday, saying he was not a fair intermediary in the peace talks with the PA.